If you drive, then you have most likely at some point in your life received a traffic ticket for any number of violations. If you haven’t yet, there is a good chance you will in the future. In most cases, you will know whether or not the citation was justified and it was without good cause, you can fight it. Although it can be frustrating and sometimes a hassle to deal with, there are things you can do to fight the ticket, and often the driver prevails. Here is the best plan for fighting a traffic ticket. There are a variety of reasons drivers get pulled over and ticketed. Speeding is probably the most common, along with broken taillights, erratic driving (swerving in and out of lanes), expired registration or inspection, failing to stop at an intersection, suspicion of being under the influence of drugs or alcohol or parking in an unauthorized area. Depending on the severity of your offense the penalties and fines can vary significantly per state. Will my insurance go up if I pay the fine? If I have to attend driving school, how will that affect my time/life? Will I lose my license because this is a repeat offense? Can I afford a lawyer to fight for me in court? Can I take time off to appear in court? Is jail time involved (DUI/DWI)? There are a few strategies to keep in mind when fighting your ticket. The best thing you can do is be thoroughly prepared and come to court armed with as much hard evidence as possible. First, you will need to send the ticket back designating that you are pleading "not guilty" and agree to appear in court. The court date should be on the ticket, if it is not, they will send you a confirmation and a court date at a later time. People are human and make mistakes and the officer who pulled you over, cited you and wrote up the ticket is no exception. Just because they wear a badge and demand respect as an authority figure of the highways does not mean they can’t and don’t make mistakes. If for example you get pulled over for not stopping at a stop sign, and you know you did. You can fight it in court especially if you have eyewitness accounts, photographs or an easy-to-read diagram, which shows the positioning of all cars and how it may have "appeared" that you did not come to a complete stop. If you make your case professionally with substantial evidence, you may get it overturned. In some cases, you can win by challenging a ticket through the process of "mistake of fact." This term means circumstances beyond your control were a factor, and the judge may rule to dismiss your case. An example of this is that you weren’t able to read a sign due to storm conditions or something blocking it and so you broke a road rule, which you were unaware of due to "mistake of fact." Convince the Judge You Were "Legally Justified"
There are cases where it makes sense not to deny your actions but support them with a justified cause. If pulling over or driving too fast or slow was in the best interest of you and other drivers, the judge may dismiss the charges. It is best in these situations to research the law or hire an attorney who is well versed in traffic law and can cite other precedent cases where your seemingly illegal actions were allowed for good cause. If you suddenly swerved to avoid hitting an animal, pedestrian or another car and you received a ticket for the offense, you can fight it due to having a good reason. You were trying to avoid harming yourself or someone else. These cases can be challenging to prove, but if you present them professionally with as much evidence as possible, you have a chance of winning. This example is another good case for using a traffic ticket lawyer who specializes in these types of situations. 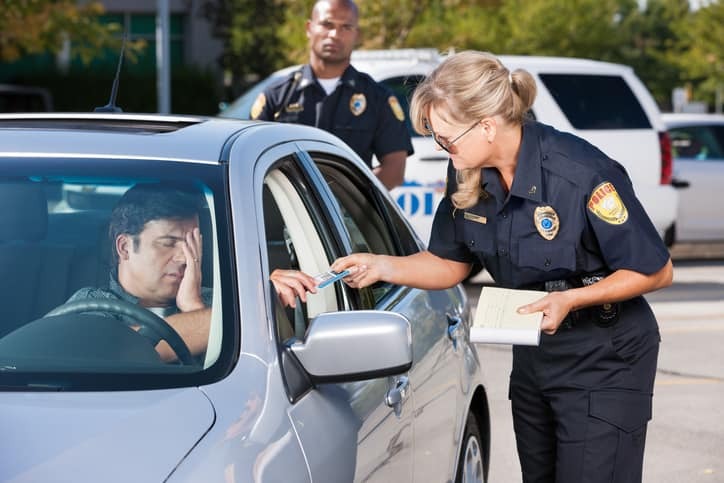 Unless you have reliable eyewitnesses and a substantial stock of evidence, it might make sense to hire a professional to help you fight your traffic ticket. There are dozens of excellent attorneys, which specialize in this type of law. Hiring a lawyer also helps your credibility showing you take this offense seriously and are choosing to fight it legally. To find a lawyer in your area, you might want to visit the courthouse website local to your jurisdiction. They will have lists available to help find an attorney that can help you fight your case. If they do not have them listed online, you can also call them to get a referral. Other 3rd party websites like FindLaw.com have distribution lists by the state for all types of traffic ticket violations. In all cases, you will need to appear in court if you are fighting the ticket. Printed on your ticket will be information about how to pay the fine, or if you choose, how to fight it. You can quickly locate the courthouse near you by visiting our courthouse locator tool. You should have to visit the courthouse only once, but if you plan on using an attorney, you may need to file more paperwork, motions and meet with them on occasion to discuss your case.